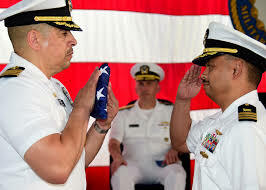 The term Flag Officer is more common within the Navy and Coast Guard rank structure and is used to identify service members who have reached the rank of Admiral, Vice Admiral, Rear Admiral, and Rear Admiral Lower Half. Within the U.S. military there are both enlisted service members, and service members that hold officer ranks. These officers are normally accountable for a sizable number of enlisted service members and provide leadership and guidance to their commands. Also, officers that serve in the U.S. Armed Forces are required to obtain a college degree prior to receiving their commission. Limited Duty Officers and Chief Warrant Officers are two exceptions to the college degree rule. They can become commissioned officers without a college degree, but if they wish to pursue further promotion they will need to obtain a college degree. While the choice to become an officer shouldn’t be taken lightly, there are several paths that lead to a commission in the U.S. military. For example, commissions can be obtained through a service academy, an ROTC program, or an Officer Candidate School. In addition, there are several avenues to earning a commission if a service member is currently part of the enlisted ranks. The officer ranks are broken into three distinct leadership roles. Service members who hold the pay-grade of O-1 to O-3 are known as company grade officers. These are mainly junior officers with the highest rank being Captain in the Army, Navy, and Marine Corps while in the Navy they are known as Lieutenants. Often, company grade officers that have achieved the rank of Captain (Lieutenant in the Navy) can hold the title of Company Commander and are responsible for an entire company within a unit such as a Headquarters and Service company comprising of about 100-250 service members. Officers that have been promoted into the pay-grade of O-4 to O-6 are known as field grade officers. Field grade officers have more seniority than a company grade officer but are subordinate to general officers. As service members climb higher in the rank structure responsibilities also increase. Field grade officers are held accountable for numerous decisions all of which can have greater consequences on those under their charge. The highest leadership roles within the U.S. military are reserved for general officers. General officers fall within the pay-grade of O-7 and above. Service members who have reached the level of a general officer, starting with Brigadier General up to General for the Army, Air Force, and Marine Corps also use the general term Flag Officer. In this instance, non-navel senior officers with a pay-grade of O-7 and above are authorized to fly their flags from their headquarters or vehicles. For example, a Major General in the Marine Corps is authorized to fly his flag from his headquarters if he is the most senior officer present. However, if both a Major General and Lieutenant General were stationed on the same base the Lieutenant General would be the officer authorized to fly his flag since he would be the senior officer. While the General Officers in the Army, Air Force, and Marine Corps can also generally be called Flag Officers, the original rank of Flag Officer was held within the Navy. Previously, in military history, senior Navy ship captains who were assigned to lead other vessels in addition to commanding his own ship were called Flag Officers. These senior officers commanded a squadron of ships in addition to leading the seamen on his own ship. Normally, officers in non-naval branches of the U.S. Armed Forces are known as General Officers while officers in the Navy or Coast Guard that hold a pay-grade of O-7 and above are known as Flag Officers. Regardless of the titles or terminology, any senior officer who has obtained the pay-grade of O-7 and above are authorized to fly their flag at their headquarters or on their vehicles provided they are the most senior officer present.